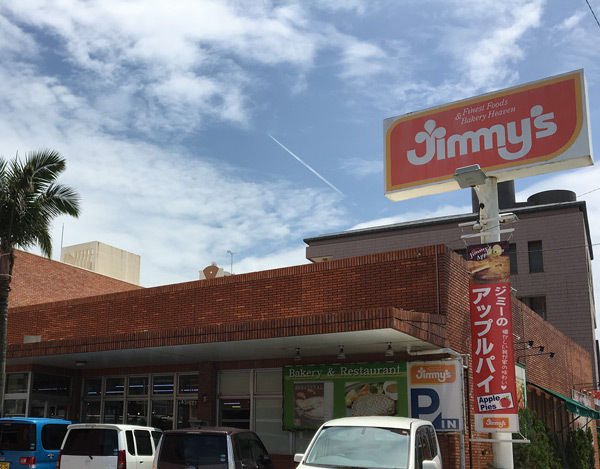 Jimmy’s is an Okinawan grocery store chain that is especially popular among foreign residents on the island. All Jimmy’s stores are housed in red brick buildings with palm trees planted around the stores. Jimmy’s has been in business since1956. The store got its name from its founder, Seihou Inamine, who used to work on American military bases where the Americans called him Jimmy. No one seems to remember any more how or why but the name is living with his stores. Before starting his business, Inamine went to Hawaii to learn baking. From there he also adopted the use of coconut flavor in his cakes, and the Hawaiian flavor in the design of his packages. Nowadays Jimmy’s signature products consist of cakes, cookies, bread, roasted chicken, soup, and imported snacks. People on Okinawa like them, and they are considered good gifts on special occasions. Jimmy’s also operates restaurants at its Misato branch in Okinawa City, Oyama branch in Ginowan, and Mekaru branch in Naha. The shop in Oyama, Ginowan, was the first Jimmy’s shop on Okinawa.